©Ⓟ1995 SYDA Foundation®. All rights reserved. Click “Play” to listen to the abhanga, Omkara Pradhana, sung by Lakshmi Joyce Wells. The recording of this abhanga is available in the Siddha Yoga Bookstore. 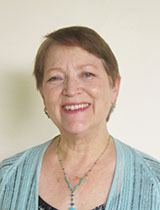 Lakshmi began following the Siddha Yoga path in 1976. Since then she has offered seva as a musician and music teacher in Shree Muktananda Ashram, Gurudev Siddha Peeth, and other Siddha Yoga Ashrams in the U.S., Australia, and India. Lakshmi served on the staff of the SYDA Foundation from 1978 to 2000 in several roles, including as a lead musician for many of Gurumayi’s tours. Lakshmi has a BA in music from the University of Washington in Seattle and an MA with a focus in holistic music education from Goddard College in Vermont. She currently works as a music teacher at the elementary school level and as a private singing teacher and vocal coach. Originally from Seattle, Lakshmi now lives in Loch Sheldrake, New York, with her beautiful cat, Pritam. I thought of Gurumayi’s presence as soon as I looked at the abhanga posting, thanks to the beautiful, bright reddish-orange background that reminds me of her. The form of the AUM symbol with the blue pearl reminds me how Shri Guru appears in subtle form in my inner eye and ear. I bow to Lord Ganesh, who awakens every sense of my being to my Guru’s presence and reveals her presence everywhere. As I listen to this sacred abhanga, I notice that I feel deeply connected with my own Self and experience silence in my heart. The sweetness of the voice combined with the power of the words makes this a sacred gift for me! This abhanga awakens the bliss in my heart. Repetition of the abhanga and contemplation of the commentary by Swami Shantananda evokes within me both deep understanding and deep reverence. I will never see the form of Ganesh in the same way; it will now be a reminder of how sound, in the form of vibrations, calls all of experience into being. Wow! My heart is full of love and gratitude for the divine creator and for all who, like Tukaram, serve the divine so readily and generously.